Hibiscus is a bushy annual plant. Parts of the flower are used to make a popular drink in Egypt called Karkade. Various parts of the plant are also used to make jams, spices, soups, and sauces. The flowers are used to make medicine. Hibiscus is used for treating loss of appetite, colds, heart and nerve diseases, upper respiratory tract pain and swelling (inflammation), fluid retention, stomach irritation, and disorders of circulation; for dissolving phlegm; as a gentle laxative; and as a diuretic to increase urine output. 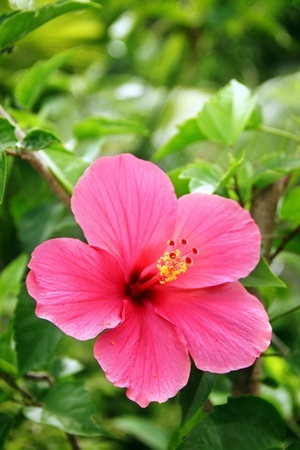 In foods and beverages, hibiscus is used as a flavoring. It is also used to improve the odor, flavor, or appearance of tea mixtures.